MONTICELLO, New York (July 9, 2018) – PCA Club Racing Trophy East competitors are heading northeast following an exciting weekend of competitive racing at VIRginia International Raceway just three weeks ago. 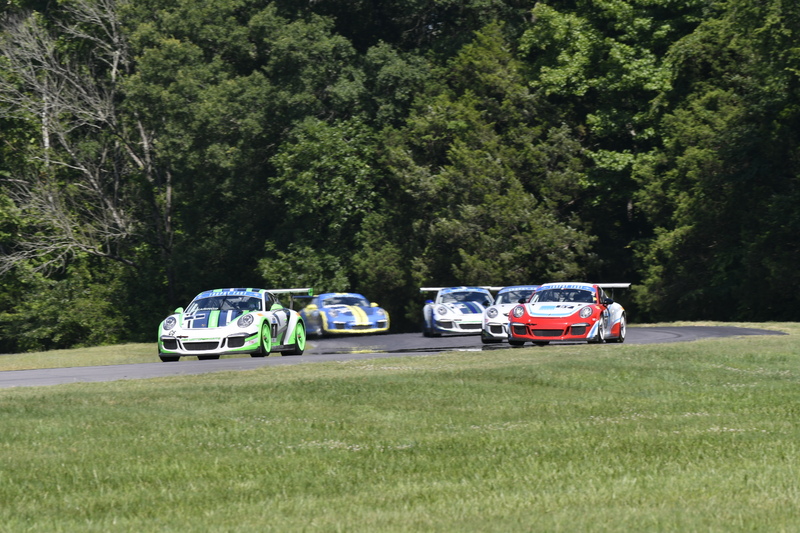 Monticello Motor Club, a premier automotive country club about two hours north of New York City, will host PCA Club Racing drivers as part of the PCA Club Racing’s Porsche of Conshohocken Presents the 2018 Riesentöter Stuttgart Challenge at Monticello Motor Club. Monticello marks the series’ fourth event of the 2018 season. The 18-turn, 3.6-mile race-grade asphalt road course was built to test a professional racecar driver, but designed to be safe for the first-time club member. The scenic course is set on 670 wooded acres and incorporates more than 1.5 miles of straights, 450 feet of elevation charges and 22 turns, including both increasing and decreasing radiuses. Following VIR, Curt Swearingin continues to lead the TE6 class in points with his ACI Motorsports teammate, Richard Edge, following in second, 114-64, and SpeedSport Tuning’s Jack McCarthy in third with 62 points. In the TE4CS class, NOLAsport’s Alejandro Galindo swept the weekend at VIR – winning both sprints and the enduro. Galindo sits in first place with 101 points, ACI Motorsports’ Efrin Castro is currently second in class with 92 points and Autometrics Motorsports’ Noël Brown is in third with 66 points. The series will welcome back BGB Motorsports’ Tom Collingwood, who competed at Pike’s Peak International Hill Climb last month and came in fourth place in class. He finished second among the Cayman GT4 Clubsport rookies (the top finishing “rookie” was IndyCar driver J.R. Hildebrand). “Collingwood created quite the buzz when others found out he had only been racing for three years and never once saw the course before he showed up a few days prior to the event,” said BGB Motorsports team owner John Tecce. Collingwood is sitting in fifth in points, and he’s aiming for additional success at Monticello. Tecce continued: “As usual, Tom continues to impress everyone with how far he’s come, even us at BGB! I look forward to having both him and the McKees back under the BGB awning at Monticello Motor Club, where Tom and I will resume normal enduro co-driving duties.”In the TE 6 Masters class, Gary Jensen continues to lead with Ken Finch in second place, 79-32. NOLAsport’s John Crosby has continued his winning streak from the past three races – sitting in first place in the TE4CS Masters class with 112 points. Charlie Craig is in second with 95 points and Hairy Dog Garage’s David Peterman is in third with 46 points. Gates are open for load-in starting at 4 p.m. on Thursday, July 12. There will be two practice sessions and a qualifying session on Friday, July 13. The 4:10 p.m. qualifying session will set the grid for the first 30-minute sprint race, which starts at 1 p.m. on Saturday, July 14. The second 30-minute sprint follows at 4 p.m. The 80-minute endurance race will start at 10:45 a.m. on Sunday, July 15.